Your speaking topics should be clear to even the most inexperienced technology user. For example, we recommend that your speaker website design includes “Keynote Speaking” in your top navigation, so that visitors know right where to click to find your topics. Also on your site, they’ll want to see videos of your previous speeches, links to any books you’ve published, and an active blog that all relate to your topic(s) of expertise. One part of establishing yourself as an expert is showing that others believe you have the answers. Ideally, a viewer wants to see lots of comments and shares on your blog as well as a plethora of followers across social media channels like Facebook and Twitter. In your speaker website design, you can put your social media links in your header and footer as well as have share options on your blog posts. Social proof also includes past clients. Get testimonials each time you have a satisfied client as testimonials are the cornerstone of a successful speaking website. These quotes should be scattered throughout your site rather than limited to a menu item. Another good way to show that your expertise is valued is to include a client logo cloud to represent the companies that have invited you as a speaker or consultant. This social proof shows puts meeting planners at ease knowing that you have solved others’ problems and will likely do the same at their event. If an individual or organization is considering you as their keynote speaker, they’ll want to know that you show up on search engines like Google and Bing. An easy way for visitors to check is through the Alexa ranking, where they can glimpse into how much traffic your site receives. When you review the numbers yourself, you want to see that a lot of people are talking about you and other sites are linking to yours. You can also check an individual’s Klout score, which shows how much social influence they have. The goal is to get as close as possible to a score of 100. The higher the score, the more influence an individual has. 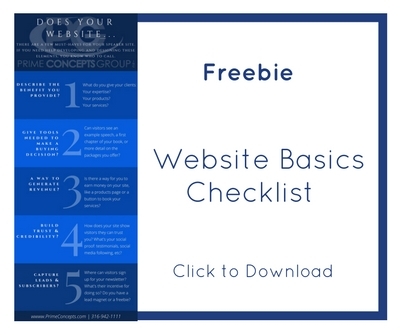 How does this tie into your speaker website design? It’s all about SEO—the keywords on your main pages, your titles and meta description, and each blog post you write. If your SEO isn’t in top shape, you won’t have a great ranking. What’s the best way to improve your site ranking? Target keywords that people who have the problem you can solve are searching for. 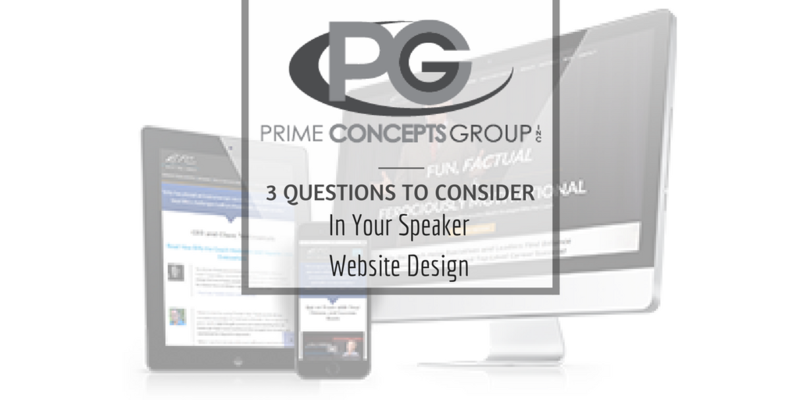 Prime Concepts Group is the number one development firm in speaker website design, so we know precisely what goes into creating a site that accomplishes all of your goals and positions you to get more gigs. Interested to see what kind of work we can do? We’ve pulled together a few favorite sites we’ve developed and designed over the years to serve as inspiration for you. It’s always helpful to see what other speakers are doing to stand out and if any common themes emerge. If you need help in the process of designing your site, we’d be glad to chat about your needs. Just call us at 316-942-1111. As a speaker who covers how diversity of thought drives innovation, Stephen Shapiro needed a site that matched his ideas. We delivered a website that bundled all that is Stephen into a presentation ready to book speaking engagements and sell products that help leaders tackle innovation challenges. For the World’s Funniest Motivational Business Speaker, it only makes sense that his banner streams a video of him working his magic to make people laugh while helping to change their mindsets and lives as a result. We wanted to make sure Steve’s new speaker website design communicated his inspirational message, his status as a celebrity keynote speaker, and his positive energy. We started by building a strong foundation—a clean, streamlined navigation and concise content. With the messaging, we took care to balance Steve’s impressive comedy credentials with the high content of his presentations and the bottom-line results he provides for his clients. Wendy Keller helps those who have experienced loss heal and get their lives working well again. We wanted to do the same to help her get her site back on track. To do so, we did a design overhaul on her already popular site to improve the user experience so that visitors could easily achieve their goals. The end result is a beautiful feel with a clean, modern design. Robyn is a team-building speaker, but her keynotes are also geared toward leadership, performance, sales, and adaptability. We wanted to highlight this, so we worked with Robyn to update and refine her messaging. Then we helped her emphasize that her motivational and inspiring keynotes also offer real solutions for business challenges. New York Times bestselling author and a Hall of Fame speaker , Shep Hyken is a leading customer service expert. By working with companies and organizations, he helps them build loyal relationships with their customers and employees. Since his site was already very successful, we were careful to retain what was working by keeping the overall look of the site while making the design fully responsive and adding more social proof on the site. We hope that seeing these examples has been helpful. Have you noticed any common themes emerge? There is definitely a style most effective when developing speaker websites and we have a team well-versed in personalizing the necessary elements to design the perfect site for you, as a speaker. Just call us at 316-942-1111 and we can get started today.